Australia loves a Party - Australians love the birth of anything or anyone new. For a maritime nation the birth of its own Navy and the manifest vessels finally arriving in Sydney Harbour were cause for celebrations honouring those who had steered the nation's safety and those who were now taking over these duties on these ships from their commanders to the lowliest seaman. Balls, fetes, galas, dinners, dances, a theatre event and a venetian floating carnival - every strata of society offered something and everyone was included, from the highest in the land to schoolchildren who lived in rural areas. The fleet is timed to enter the Heads at half past 10 o clock the flagship Australia leading followed by the cruisers Sydney, Encounter, and Melbourne, and the torpedo boat destroyers Warrego, Yarra and Parramatta. The vessels will be met at the Heads by steamers conveying Federal Ministers members and friends, and State Ministers and party. There will be a stately procession into the harbour and after the fleet is anchored Rear Admiral Sir George Patey, will call on Admiral Sir George King Hall on board the Cambrian and then proceed to Admiralty House where he will meet the Naval Board and be presented to His Excellency the Governor General. Afterwards the Rear Admiral will call upon the State Governor (Sir Gerald Strickland) In the afternoon a party from the war vessels will attend the A.J.C. Spring Meeting at the Randwick race course and in the evening the officers of the fleet will be entertained at a banquet in the Town Hall at which His Excellency the Governor General will preside. The fleet and the city will be illuminated during the evening. THE FORESHORES. CROWDS AT VANTAGE POINTS. The populace turned out in their tens of thousands to accord a fitting welcome tothe fleet, and every headland was occupied by crowds, tensely alert, awaiting the ships. Ferry steamers moved slowly to and fro, also waiting, each packed with people. There was a big assemblage on South Head, every tram and boat for Watson's Bay from early morning being crowded to its utmost capacity. All round the Gap and beyond it spectators with their eyes strained seaward lined the cliffs, forming a living link, and had a magnificent view of the approach of the fleet from sea. All the head-lands on the northern side of the harbour were thickly thronged, and there would have been many more on Bradley's Head, George's Head, and other points, had the tram service been able to cope with the traffic and carry all who wanted to go there. As it was hundreds of North Sydney people gave up hope of getting to these reserves, and came over to the city side instead. Oct 4, 1913: Spectators on Bradley's Head watch the RAN's first Fleet Entry into Sydney Harbour - HMAS AUSTRALIA and HMAS MELBOURNE [I] have just passed from view, HMAS SYDNEY [I] can be seen in the middle of the Harbour [right], with HMAS ENCOUNTER closer to the shore. Photographer unknown; appeared in a View Publications Pty Ltd booklet 'Warships in Australian Waters' [Sydney 1984] p29. There were spectators all along both sides of the harbour, one of the most popular vantage points being Mrs. Macquaries Chair, which commands an extensive view of the waterway and Garden Island. The "Chair" was packed with people. Another favourite spot for sightseers was the Government House grounds, and the slopes of the adjoining Botanic Gardens also accommodated large numbers; while huge crowds swarmed along the sea-wall of Farm Cove. Anticipating that a fine view of the approaching ships would be obtained from the many points along the coast toward Botany Heads, great numbers took up positions on Ben Buckler and the cliffs of Bondi, Bronte, Coogee, Maroubra, and Long Bay. The ships, however, instead of steaming up the coast, had gone out to sea, and entered the Heads from an easterly direction, and so those south of South Head got only a distant view. CROWDS AFLOAT. Thousands of people were afforded an excellent view of the procession of warships up the harbour from the decks of ferry and other boats, most of which took up positions between George's Head and Bradley's Head. Excitement ran high when the flagship and her consorts came within batting distance, and cheer upon cheer rose from the occupants of the watching boats. Some of the boats were provided with bands, which rendered patriotic airs, "Rule Britannia" being the favourite. OFFICIAL VISITS. Immediately after the Australia was moored in Farm Cove Admiral Sir George Patey paid an official visit to Admiral Sir George King- Hall on the Cambrian, and the latter immediately returned the visit to the Australia. On each occasion the visiting Admiral was received by a guard of honour. The greetings of the admirals was, however, a most significant event, for it marked officially the occasion around which all the day's celebrations were centered, viz., the transference from the Imperial authorities to the Commonwealth Government of the Australian naval station. GARDEN ISLAND. THE SOCIAL SIDE. Garden Island, the picturesque little spot in the harbour that for so long has been associated with the navy, decked itself out in all its finery to greet the Fleet. Flags fluttered everywhere, and from the signal tower on the hilltop stretched long lines of bunting. And in place of the everyday blue of thesailors' uniforms, there were seen the bright and beautiful colours of ladies' dresses, adding an unwonted touch of gaiety to the island. Here the social side of the day's doings was made manifest. On the little eminence that crowns the island were congregated the wives and daughters and sisters and cousins of the officers of the Australian Navy. With them were the officers of the Naval Brigade and the Naval Reserves, and the officers of the Garden Island depot. And there were also present a large number of military officers, paying their tribute to the other arm of the service. Down on the path that circles the island were drawn up the O.J. Brigade, 70 strong, fighting their battles over again, and adding their benison to the new navy. And most hopeful sight of all-near by was the Young Brigade, 650 Naval Cadets, lined up to salute their Admiral and their warships. Picture to right ' At The Reception for the Navy, Sydney Harbour, October, 1913. Picture courtesy State Library of NSW. As the flagship and her consorts swung past Bradleys Head and glided gracefully up the harbour (the Australia wreathed in the smoke of her saluting guns), the blue line on the fringe of the island sprung to attention. There came the order "fix bayonets," and with a musical clatter the gleaming steel points were adjusted. Naval Reserve, Naval Cadets, the old Naval Brigade, and the veterans stood ready, and as the flagship drew level with the Island, Commander Dunn gave the order "Naval guard, present arms." Like clockwork the line came to the salute, the bugles blared, and the Naval Brigade Band played "Rule Britannia." Like an echo came the answering bugle from the Australia, as, dipping her flag, she proceeded to her moorings in Farm Cove. Each warship in turn passed the island. The main spectacle being over, the officers of H.M.A. Naval Yard and H.M.A.S. Penguin entertained several hundred guests on the island. Two large marquees were erected on the hill, and refreshments were dispensed tothe guests. Amongst the guests were Sir Wm. and Lady Cullen, the Inspector-General of Police and Mrs. Day, Mr. Joynton Smith.M.L.C., and Mrs. Smith, Mr. and Mrs. C. C.Lance, Mr. and Mrs. T. H. Keele, Mr. and Mrs. H. D. Walsh, Capt. and Mrs. Newton, Capt. and Mrs. Cummings, Miss Hilda Vining, Mr. and Mrs. Shearston, Mr. and Mrs. Hixson, Dr. and Mrs. Purdie, and a large number of civilians. BY NIGHT. THE CITY ILLUMINATED. Let it be admitted at the outset that there was an element of disappointment in the first night's illuminations of the city in honour of the home-coming of the fleet. This was due not to the citizens themselves, but to the thunderstorm which broke over the city early in the evening. Just at the hour when tens of thousands of citizens were about to leave the suburbs, the clouds which had been banking up during the afternoon rolled over the metropolis. Peals of thunder followed lightning flashes, and rain came down heavily. It looked most inauspicious for the evening's jubilations. But the storm passed over. The moon emerged from the clouds. The stars shone. There was a belated rush to the city, and tens of thousands of citizens thronged the streets in holiday mood, enjoying the illuminations. And though the crowds were dense in the main thoroughfares, at Circular Quay and in the Domain it was yet possible to get about and see things. The thunderstorm had cleared the air, and those that came into the city were glad they did so. The illuminations, while not being on a particularly lavish scale, were worthy of the occasion. The city was embellished with myriads of coloured lights and lanterns. Sydney decked herself in jewels to welcome her sailors. Circular Quay on an ordinary Saturday night is a semi-circle of lights, with the ferry boats gliding in and out, casting shimmering reflections across the waters. But on this occasion it was a night to remember. The old familiar background of the city lights assumed a new and varicoloured brilliance. The ferry wharfs were linked together with lines of light. First of the illuminations to greet the eye was the artistic display of the Sydney Harbour Trust. Facing the Quay was a huge silver star, below which, on an azure shield, was the well-known Southern Cross and the seal of the Trust picked out in red and white lights. The Customs-house had its outlines picked out in electric light, and above the clock there shone the welcome "Greeting to Fleet." Up Phillip-street aband was playing "The Star Spangled Banner" and the thoughts of many reverted to the occasion a few years back when the citizens welcomed the Great White Fleet from America. All round the Quay the buildings were brightly illuminated. At Fort Macquarie the tram depot gave a pleasing touch of colour to the scene. A huge shield in the Southern Cross was outlined in the tricolour, and across the front of the building facing the sea was "Welcome" in huge letters. On the other side was the Union Jack surrounded with stars. At the entrance to Government House grounds, near Man-o'-War steps, once more was emblazoned the prevailing "Welcome." George-street was pretty much like the Great White Way of New York would be if coloured. In the bright light the flags and bunting could be seen clear as day. All the buildings along the street to the railway added a splash of colour or a blaze of lights to the picture. First came the Fire Station, ablaze with colour. The Royal Naval House in Grosvenor-street made a pleasing display with coloured lights, and here many of the naval men found a welcome. Martin-place is recognised now as the show thoroughfare. At the corners of George-street and Pitt-street the four white pillars were picked out with pink lights, and connected with silver strands, the effect being really artistic. The General Post Office made an imposing spectacle, outlined in electric light, with a special blaze focussed on the frontstatuary, and long lines of white lights fromthe tower to the cornors. Another very effective display was that of the Town Hall, probably the most ambitious of all the Illuminations. The lines of the civic edifice were allmarked with lines of light. Long strands ofelectric light stretched from the portico tothe tower. Here a fine printed star in co-lours looked most artistic, while on either side were huge letters showing the royal "G.B." George-street here was as light as day, and theflags added more colour to the scheme. Opposite the Town Hall was another effective colour display. ROYAL NAVAL HOUSE. ACCOMMODATES 743 MEN. The Royal Naval House in Grosvenor-street on Saturday evening presented an interesting sight. Special efforts were made to decorate and illuminate the building, and the work of Superintendent Shearaton and his men is deserving of special mention. The Royal Naval House has 400 beds, and in addition 34 stretchers that can be brought in house. But the Superintendent was called on to make provision for the largest crowd of naval men who have ever put up in the building for one night. His staff found rugs, blankets, and mattresses for an additional 209 men. "Excellent," said Mr. Shearaton, referring to the conduct of the men. "I have had many years' experience amongst naval men, and I must say that, the behaviour was splendid. We called the men at 6 o'clock on Sunday morning, and in 25 minutes the whole of the 743 men were up, washed, and dressed, and on their way to their ships. Admiral King-Hall was very solicitous as to the men's welfare, and was in communication with the superintendent both on Saturday evening and Sunday morning. THE FLEET. A BUSY DAY. BRILLIANT WATER SCENE. CROWDS ASHORE AND AFLOAT. Nothing untoward marred the holiday festivities yesterday (Monday 6th of October, 1913) in connection with the welcome of the Australian section of the Royal Navy. There was a general desire manifested to visit the warboats, especially the flagship, the Australian, and from early forenoon till late in the afternoon she was boarded by throngs of visitors. The Australia needed to be a stout ship to carry the surging cargo of humanity that swarmed about her like myriad bees clustering round a hive, but her great width of beam made her equal to the multitudinous nature of the day's call. Left: Lord Thomas Denman (1874-1954), by unknown photographer, 1910s. nla.pic-an23334619, courtesy National Library of Australia. Admiral Patey received some distinguished visitors in the morning. Just before noon Lord Denman paid the Australian Admiral a return visit. The Governor-General was accompanied by Sir Walter Barttelot, Commander Brownlow, and Colonel Wallack, CB. (the State Commandant). His Excellency was received by a guard of honour. Having paid his respects to the head of the fleet, his Excellency left the flagship to the accompaniment of a salute of 19 guns. The State Governor, Sir Gerald Strickland, also paid the Admiral a return call. His Excellency was accompanied by Major-General Finn (Private Secretary), and Captain Talbot, A D.C. Sir Gerald Inspected the guard of honour, and left the ship amid the salvos of the customary 17-gun salute. The Minister for Defence, Senator Millen, also paid Admiral Patey an official call. The Minister was accompanied by Rear-Admiral Creswell, first naval member of the Naval Board. ON THE FLAGSHIP. CROWDS OF VISITORS. OUT-OF-THE-WAY CORNERS. Thousands of people explored the flagship yesterday- Though all the ships were open for inspection, it was the Australia that everyone wanted to see. A few went over the Sydney, but the Melbourne and the rest of the fleet had hardly any visitors. Everywhere about the Australia men, women, and children, strolled and clambered. They climbed every ladder that went upwards, and descended every bolo-that went downwards They penetrated the very bowels of the ship, 20 foot and more below the water… It was their battle cruiser, and they inspected It from top to bottom, and came away impressed with Its stupendous strength. Over and over again the Australia has been described, and yet the half has not been told. The tale of her size, her guns, nor armour, her engines, must be familiar by now to all ordinary diligent readers of papers. There is no need to ever enter into further details In regard to these features. But there are a lot of little odds and ends of information that have not yet got into print. If you are a tall man you will have in making your way about the recesses of the ship to move about with head bent, for the spaces between decks are designed for men of medium height only. There is plenty of ventilation below. That, indeed, is one of the features of the modern man-o-war. Pumps distribute currents of air along windshafts to every point, and at times the breezes blow fresher than on deck. One of the things that strikes the visitor forcibly is the vast difference between the quarters of the officers and Its midshipmen, and the quarters of the men. In the one case there is ample elbow room, not to speak of furnishing and general conveniences; in the other, there is hardly space to move about. There is much murmuring among the men on this account. THE MIDSHIPMEN. The midshipmen are aristocratic young gentlemen. There are 14 of them, all, as they Impress upon one, from "the Royal Navy." Some are disappointed with Sydney Harbour. "I thought you would ask me that," observed one rather pretty boy, with golden curls surmounting a fresh-complexioned face, when a pressman Jocularly ventured an Inquiry as to his impressions of Sydney. A ripple of boyish laughter had gone around the gunroom. "we’ve had the beauties of Sydney Harbour dinned into us over since we Joined the ship, and expected that it would be a much finer place than it is."
. "In what way were you disappointed?" "we thought It would be larger, and generally finer. Then, as first city-well, it looks finer from the outside than the inside!" They are a nice lot of healthy looking, Intelligent boys, the makings of good officers. Just now they take themselves rather seriously, but that is characteristic of the "middy" everywhere. They will grow out of that by and bye. Two chameleons, presented to them at Durban, are the pots of the gunroom. The ship is, when away from port, a separate cosmos with laws unto Itself, and the commander acts as a sort of magistrate, the captain who is In supreme command, hearing the more serious cases, and being the court of appeal. There are no marines on the Australia, but there are ship's police, whose duly it is, amongst other things, to check the lists of men on leave. At their bead is a master at-arms and four corporals. There is a gaol also. It contains five cells, and in each is to be found a Bible, so that an offender may get a little spiritual comfort, if he gets no physical comfort. The cells had two occupants yesterday, and there were two others awaiting trial, who were gazing wistfully through port- holes. They were compelled to remain within the precincts of the gaol, being guarded by a sentry. They will answer to the charges preferred against them-whatever they are to-day. There are telephones everywhere. In the noisy part of the ship they are In booths. They are on the bridge, In the control stations, the gun turrets, the offices, and even right down in the Stokehold. There are 14 of them altogether, and If one lifts a receiver and speaks there comes an immediate answer from the exchange, and connection with the number wanted. It is quite a revelation for an untravelled Sydney man to have this demonstration that it Is possible-to conduct al telephone system without the nerve-racking and profanity-producing experiences that happen to those who are compelled to use the city telephones. The common battery system is in operation, a light showing on the switchboard when a call is made. To-day connection will be established between the warship and the Sydney exchange by means of a cable from Man-o'-war Steps, and thus not only will one be able to get Into communication with the ship from Sydney and the suburbs, and those centres that are linked up with the city by telephone, but it will be possible to speak to and from Melbourne as well. "Sick Bay" is the name by which the hospital of a warship Is known In the service. It seems In the case of the Australia to have been put In the noisiest part of the ship in the after-part, right under the guns. The "Herald" representative happened to drop In yesterday Just as a salute was being fired from the little three-pounders, and was satisfied that "Sick Bay" was no place to be in when big guns were barking. Not a day passes but some portion of the hospital accommodation is occupied by cases of sick- ness or accident, and as fast as the patients are discharged cured and well they are replaced by others. There are always on the "visiting list" of the ships' surgeons numerous cases of minor ailments and accidents which In themselves do not incapacitate their subjects from duty, but which require constant watching and attendance. The hospital is fitted with ten cots closely but conveniently arranged. An operating table, chests containing fully-equipped cases of all the most modern surgical Instruments and appliances, full supplies of bandages, wrappings, surgical dressings, and sterilising appliances are all to be found there. A room off the hospital Is used as a dispensary, and here, as In "Sick Bay" Itself, everything Is right up to date and absolutely spotless. There is in connection with the hospital a steam disinfector, for the disinfection of the clothing and bedding of all men suffering from infectious diseases. This Is a matter of vital Importance, of course, in a crowded warship. INSPECTING THE FLAGSHIP. 'ALL SORTS OF CRAFT .WERE USED TO CONVEY VISITORS TO THE 'AUSTRALIA ' YESTERDAY. There is a post-office, which at present is handling the mails for the whole fleet. It is run just like any ordinary post-office, having three Inward and three outward mails a day. Yesterday 10 bags of mail matter, mostly from the old country, representing between 2000 and 3000 letters and newspapers for those on the ships, were sorted and delivered. There is a printing office aboard the ship. It is not a very large affair, but the plant, though small, is a good one. There are' a couple of frames, filled with cases of plain and fancy types, n "stone," and a treadle machine. The printer and a couple of assistants And plenty to do. There are official orders to be put into type, and official forms for the clerical and other staffs and menus to be printed, as well as occasional concert programmes. At the head of the ship is the Flag Captain. The Admiral. Is, of course, the supreme head, but not of the Australia alone, and no more of the Australia than of the Melbourne, Sydney, Encounter, or other ships. He happens to live aboard the Australia. That is all. The captain is the king of the Australia; the Admiral is the Emperor of the fleet. The captain's pay is £889 per year. The commander handles the men. His position Is no sinecure. Not that the captain's is, but the commander has to be about everywhere, and at all hours. His pay is £593 per annum. Then there Is the senior lieutenant, who is concerned with navigation only. Next to him is the first lieutenant, who is in charge of the men's deck and upper deck. There are three senior lieutenants, who do not keep watches. Each of the remaining lieutenants-the gentlemen one sees walking .about .with, telescopes under their arms, apparently more for ornament than for use-have definite charge of an army of workers, and keep watch in turn. The ordinary lieutenants get £373 per year, their pay rising to £410, with emoluments. Then are eight warrant officers-the gunner, torpedo gunner, boatswain, the carpenter, the signal boatswain, are some of them. They are responsible for all the stores on the ship. The carpenter turns his hand to a lot of things. He has to see that the decks, boats, guard rails, and stanchions are kept in repair. He is also the painter. The Australia gets eight coats of paint a year, and ho has to provide it. Fourteen hundredweight of white lead is required for each coat. Altogether about 20 tons of point are used on the Australia alone In a year. He also has to make the targets for practice at sea. The gunner is responsible for the magazines and shell rooms, all the guns and fittings, and hydraulic gear, the signal boatswain for all signals, the torpedo gunner for all the electrical contrivances, motors, dynamos, wireless, and, of course, the torpedos as well. They are all highly trained experts in their particular lines. THROUGHOUT THE AFTERNOON" THE DECKS OF, THE GREAT BATTLE-CRUISER ,WERE CROWDED WITH EAGER SIGHTSEERS. The seamen are up at 5.30 in the morning, and start work at 6 o'clock. They keep the ship clean, they polish up the brasswork, and' they drill-drill incessantly. Besides them there is an army of stokers; there are cooks, stewards, electricians, artisans of all kinds, and no end of miscellaneous ratings. There is also a band, which discourses music while the men are at breakfast, and for the officers while they are at dinner. They have little other work to do than to keep their quarters clean, and learn the latest rag-time airs. 10.45 a.m.-March through city, then will form up in old Government House grounds, then march, via Macquarie-street, Hunter street, Pitt-street, Martin-place, George street, Bathurst-street, Elizabeth-street, St. James-'road, College-street, Oxford-street, and Flinders-street, to Royal Agricultural Society's Grounds, Moore Park, where the whole party will be entertained at luncheon by the Federal Government. A map of .the route was published in yesterday's issue. 12.30 p.m.-Federal Government's banquet to men at Royal Agricultural Hall. In the afternoon there will be an officers' "at home" aboard the Australia. 8 p.m. to 10 p.m.-A band will play in Hyde Park. THE AUSTRALIAN FLEET. Another Batch Entertained. Another body of men from the Australian Navy was entertained by the Federal Government at luncheon at the Agricultural Grounds, Sydney, on Thursday. The men were drawn from the Australia (200), Sydney (100), Melbourne (100), Cambrian. (120), Encounter (80), Pioneer (30), and several from the Psyche, the destroyers, and the Tingira . Senator Millen, the Minister for Defence, with Admiral Cresswell, welcomed the men on behalf of the Australian Government. He hoped that the festivities would compensate them for the monotony of the long voyage to Australia. At the call of Captain Gordon-Smith cheers were given for the Australian Government and Senator Millen. The school children's demonstration in honor of the Australian Fleet took place on Thursday on the Sydney Cricket Ground, and Young Australia's welcome to our defenders was very hearty. After the children had filed to the ground they were formed up in a mass in the centre with a single line of boys round the edge representing the points of a star. When Sir Gerald Strickland, the State Governor, arrived with Admiral Cresswell, the presentation of a silk flag was made by Mr. P. Board, Under-Secretary for Education, to a company of sailors from H.M.A.S. Australia on behalf of the school children. The flag was broken from a masthead by Lady Cresswell, and was greeted with tumultuous cheers. Then it was hauled down, and Mr. Board handed it to Lieutenant Euman, who was in command of the men from the Australia who had marched on to the ground. Mr. Board said:, "It is the desire of the .children of the public schools of State, to show that they recognize the coming of the fleet as a great event in their country 's history. In every school in the land the story of the fleet has been told and heard with pride by many thousands of young Australians. To those young people the flag which they wish to present today stands for a national event which they heartily appreciate, and by its combination of the Union Jack with the Australian Stars it stands for a sentiment to which they cordially respond. I have the honor, on behalf of the schools of New South Wales, to ask your acceptance of this flag for His Majesty's ship Australia." THE FLEET. VISITORS FROM THE COUNTRY. SYDNEY. October 10. And at the end of this week - the 2013 Celebrations begin!! 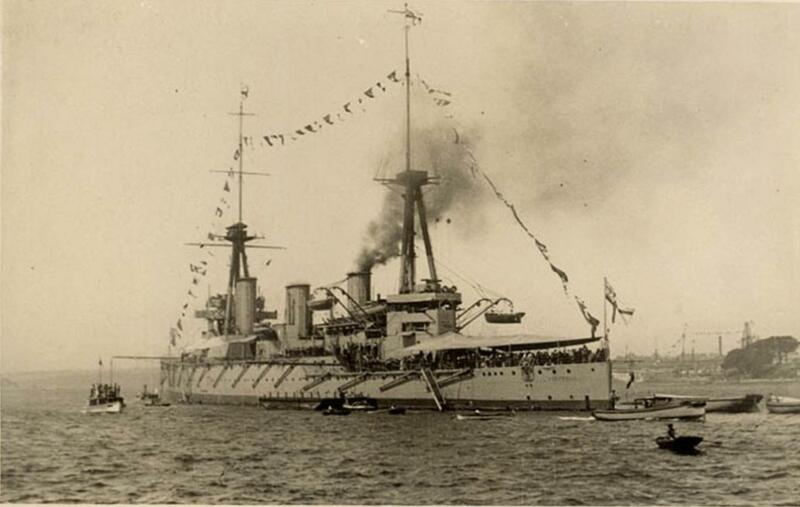 Flagship of the Royal Australian Navy, HMAS Australia, Sydney Harbour, circa 1913 by unknown photographer. Australian Fleet Celebrations of October 1913 - A Week of Welcomes - threads collected by A J Guesdon, 2013.